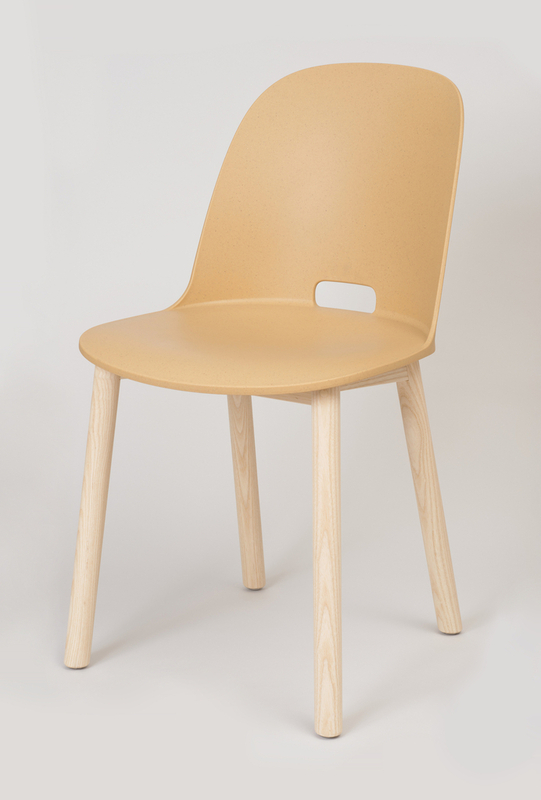 A fine example of Emeco’s commitment to environmentally intelligent solutions, the Alfi seat and back, made in Vermont, are formed out of 100% reclaimed post-industrial waste, using 92.5 per cent polypropylene combined with 7.5 per cent wood fibre. Wood polymers are composites made from reclaimed industrial polypropylene waste collected from the plastic manufacturing industry and reclaimed wood fiber, sawdust, or shavings from the lumber industry. The legs, made from responsibly harvested ash wood, are formed by Amish craftsmen in the Lancaster, Pennsylvania area near the Emeco headquarters. The chair boasts a simple and smooth silhouette with an elliptical hole in the back of the seat that is designed to aid carrying and moving. This chair’s beautiful pragmatism and accessibility, in terms of both design and cost, meet the needs of contemporary living in a desirable way. The Alfi Chair is included in Making | Breaking: New Arrivals, on view through October 29th.